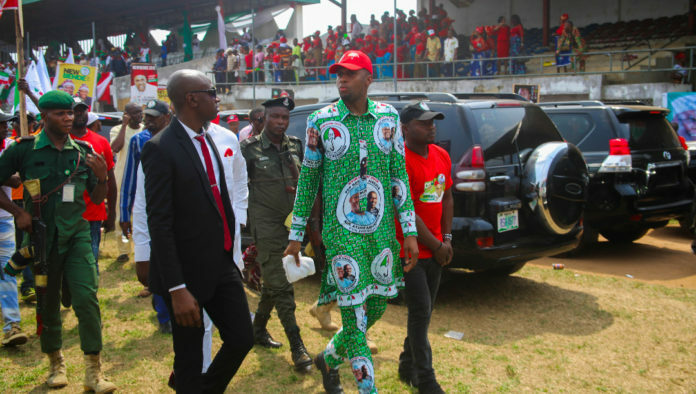 People’s Democratic Party, PDP, House of Representatives candidate for Bende Federal constituency, Chima Anyaso has called on Nigerians, especially Abians and all youths across Nigeria to vote massively for the PDP saying that only by voting for the PDP can Nigeria experience economic restoration and progress again. Anyaso made the call today, Saturday, in Umuahia when he joined other prominent politicians to welcome the presidential campaign of Alhaji Atiku Abubakar to Abia state. The Igbere born Oil and Gas mogul who is also the founder of New Nigerian Movement NN19 called on Nigerian youths to choose a leader who is capable of creating jobs, restoring failed project and can attract investors, he noted that the way Nigeria is going, things will get even worse except the PDP candidate, Alhaji Atiku Abubakar and his Vice Peter Obi are elected. Anyaso went further to say “the principal reason that I joined politics is because I am concerned about the gross poverty in this country and the way the economy is being mismanaged. I trust in the capacity of Alhaji Abubakar to turn things around. When I am elected and resume at the National Assembly, I will join other house members and like minds to promote bills and pursue policies that will lead to economic progress”. “I am worried that things are already bad and we must not allow it to get dangerously worse, so Nigerians and indeed Abians should support and elect Atiku/Obi. On our part in Bende, we are fully committed to achieving victory for PDP in the Presidential, Governorship, Senate, House of representatives and all other elective offices for which the PDP has put forward candidates” Anyaso said.